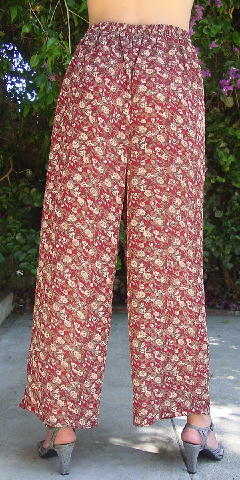 These late 1980s palazzo pants are by A.B. Waldo Los Angeles. There's no fabric tag, but they feel like a synthetic. The fabric is somewhat see-through. They have a red-wine background with flowers and leaves in bone and various shades of brown and green. The front has a 1 3/4" wide waistband and the back side has a 1 1/4" wide elastic. 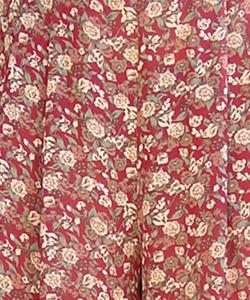 There are pleats extending downward from the front waistband and the back has gathering extending downward from the elastic. 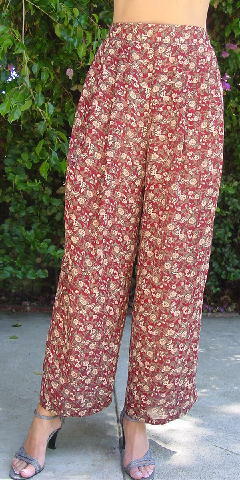 The tag says size M.
waist to hem 41 1/2"